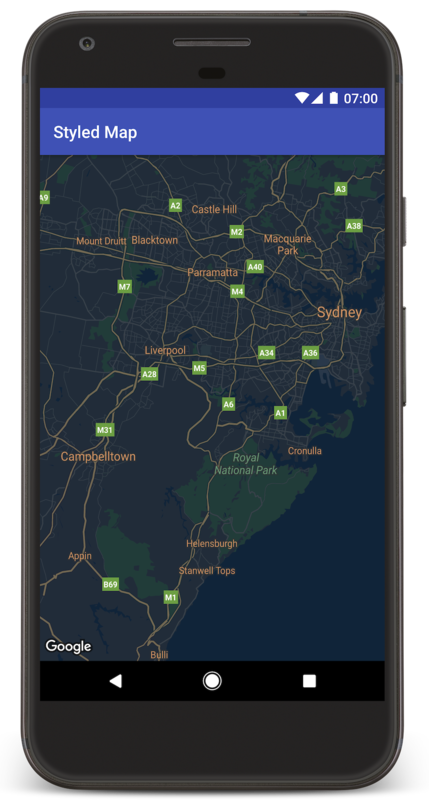 This tutorial shows you how to add a map with custom styling to your Android app. The tutorial uses night mode as an example of custom styling. With style options you can customize the presentation of the standard Google map styles, changing the visual display of features like roads, parks, businesses, and other points of interest. This means that you can emphasize particular components of the map or make the map complement the style of your app. Styling works only on the normal map type. Styling does not affect indoor maps. Paste your API key into the value of the GOOGLE_MAPS_API_KEY property. When you build your app, Gradle copies the API key into the app's Android manifest. Android Studio invokes Gradle to build the app, and then runs the app on the device or on the emulator. You should see a map with dark (night mode) styling, similar to the image on this page. This part of the tutorial explains the most significant parts of the StyledMap app, to help you understand how to build a similar app. Add a resource to your development project, containing your style declarations in JSON format. You can use a raw resource or a string, as shown in the examples below. Note: The sample app that you downloaded from GitHub uses a raw resource. To style your map, call GoogleMap.setMapStyle() passing a MapStyleOptions object that contains your style declarations in JSON format. * A styled map using JSON styles from a raw resource. // when the map is ready for use. * The API invokes this callback when the map is ready for use. // Position the map's camera near Sydney, Australia. * A styled map using JSON styles from a string resource. // method of the GoogleMap object. See how to hide features on the map with styling.